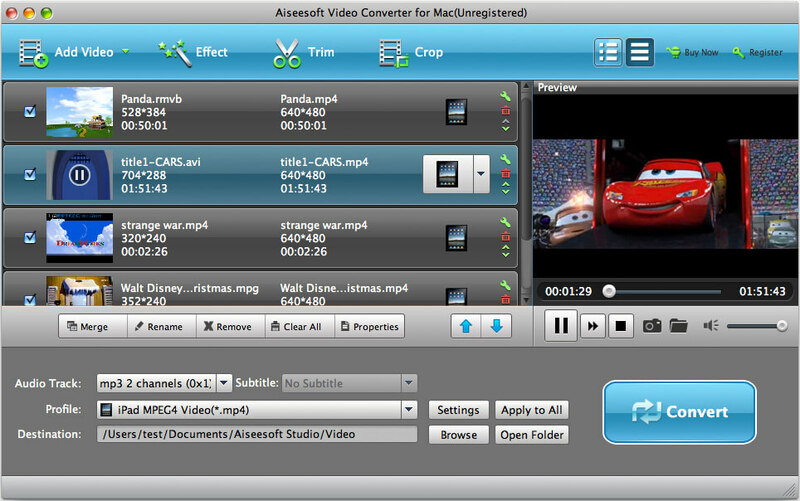 Aiseesoft Video Converter for Mac is a total Mac Video Converter which can convert between all popular video formats. And this software plays the role of Audio Extractor can extract audio track from video file and convert them to audio files. This best Video Converter for Mac also works perfectly with almost all the popular video/audio players, such as iPod touch, iPod nano, iPod classic, iPhone, Apple TV, PSP, Zune, Creative Zen Vision, Archos, iRiver, HP iPAQ, General Pocket PC, BlackBerry, Xbox360, PS3, YouTube, Mobile Phone. Besides it allows you to adjust output video effect, trim video/audio, crop video, add watermark to your video and merge video files into one output file. Aiseesoft Video Converter for Mac is designed for Mac users to convert between all popular video and audio formats with fast conversion speed and high output quality. It is a Total Video Converter for Mac can convert between all popular video formats, including MPG, MPEG, MPEG 2, VOB, DAT, MP4, M4V, TS, RM, RMVB, WMV, ASF, MKV, AVI, 3GP, 3G2, FLV, SWF, MPV, MOD, TOD, QT, MOV, DV, DIF, MJPG, MJPEG and HD TS, HD MTS, HD M2TS, HD MPG, HD MPEG,HD MP4, HD WMV, QuickTime HD MOV, HD H.264, HD RM. This software even plays the role of Audio Extractor can extract audio track from video file and convert them to MP3, MP2, AAC, AC3, WAV, WMA, M4A, RM, RAM, OGG, AU, AIFF, APE, FLAC, NUT audio files. With the best Mac video converter you can output videos for iPod Touch, iPod Nano, iPod Classic, iPhone, Apple TV, PSP, Zune, Creative Zen Vision, Archos, iRiver, HP iPAQ, General Pocket PC, BlackBerry, Xbox360, PS3, YouTube, Mobile Phone. 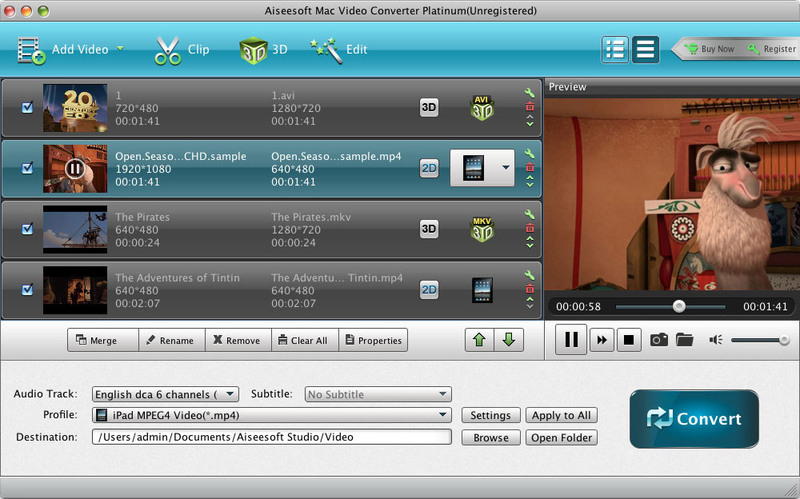 With Aiseesoft Video Converter for Mac, you can adjust output video Brightness, Contrast, Saturation and Volume. The "Deinterlacing" function can convert an interlaced video to the progressive one to avoid mosaic.